Pioneer of the tonkatsu craze in Manila, Yabu: House of Katsu opened its ninth (9th) store in Power Plant Mall, Makati City last September 30. We were there the night before and a ribbon cutting ceremony was held. It was my first time being invited for a private dining event, but I am no stranger to this restaurant's goodness. Appetizers and drinks were served first. We had Tuna Tataki, Katsu Spring Rolls, Stuffed Chicken Wings with Blue Cheese, Tamagoyaki and Menchi Tamago. I recommend the Tuna Tataki and Katsu Spring Rolls. Introduced earlier this year is Yabu's new and exclusive Signature Cocktails by Erwan Heusaff and we got a taste of those as well. Kyohime was not available at the time so I ordered Chie. I'm not a sake & whiskey kind of girl but I enjoyed this drink. 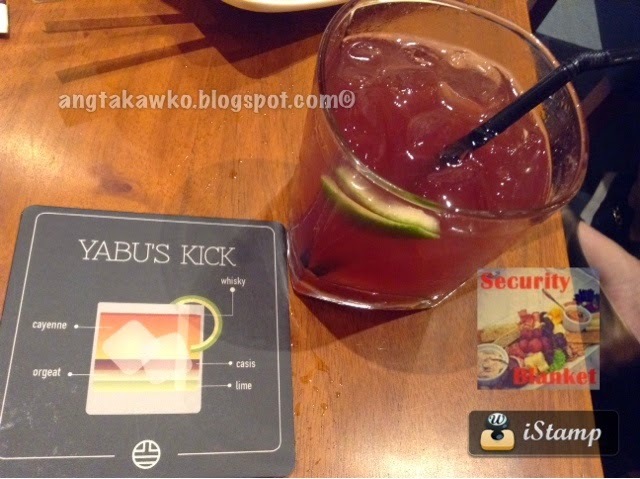 Even Stephanie's drink called Yabu's Kick, which she finds strong. Other signature cocktails: Honshea, Highball, Kyohime, Jasmine Blossom, Yuzu Sour. Deviating from my usual curry set order, I chose the Tori Menchi Katsu Set - minced chicken stuffed with ham and cheese + a bowl of Japanese rice + miso soup + cabbage + fruits. I realized this was the first time I have seen wasabi in yellow. Note: This branch has a smaller kitchen so expect some of your usual orders might not be available. Visit Yabu: House of Katsu at SM Megamall, SM Mall of Asia, SM Southmall, SM Aura Premier, SM North EDSA, Alabang Town Center, Greenbelt 5, Robinsons Magnolia, and of course P1, Rockwell Power Plant Mall.